My last post focused on finding myself in the place I meant to go to, but for something totally different than I expected. This past week, I realized that now that my schedule isn’t as structured as it was when I was working full-time, things seem to be moving in all sorts of unexpected directions. For example, this is the week when the big renovations start to the bottom level of our home after the water damage earlier this year. The insurance companies involved gave their OK, the cabinets and flooring are selected and the renovations are scheduled. So the big plan last weekend and this week was to clear out everything downstairs – the bookshelves and the kitchen cabinets and whatever else to prepare for demolition/rebuilding. But then last Thursday afternoon, the house didn’t seem to be cooling down. The temperature outside was about 119 degrees and it was starting to get a little uncomfortable inside. We called an air conditioning company, turned on all our fans and that evening endured the high-80s temperature inside. Then I spent Friday morning packing and doing a little work then me and the boys and our dog headed to my Dad’s house for the weekend. My husband stopped by at the store on the way home from work, we had Shabbat dinner at my Dad’s house and then stayed through Tuesday morning. The times we stopped back at home to pick up or drop off things, the temperature was 94-95 degrees. Then on Sunday, the boys were supposed to sing at a little Fourth of July event, but when we got in the car and I turned the keys, the ignition made a few clicking sounds then stopped. My husband was about to leave to teach one of his students and told me that there should be a AAA receipt in the glove compartment that would have information about the battery. We had gotten a new battery nearly three years ago, under my husband’s account, and we found out that it would be replaced for free if he would be there when the technician arrived. 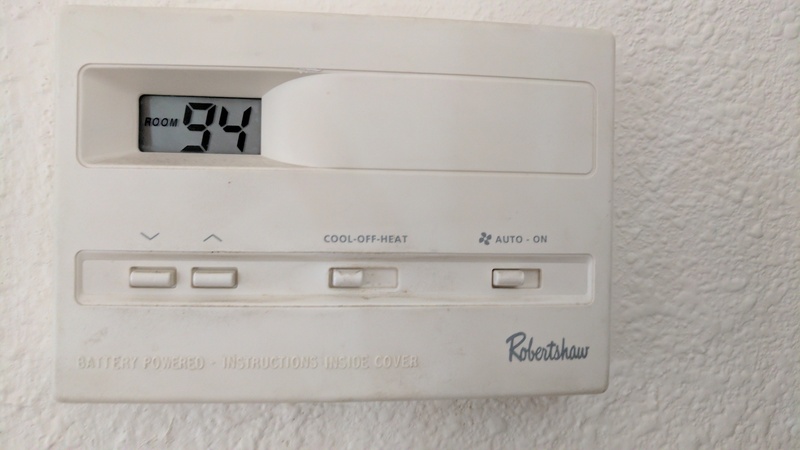 So he rescheduled his appointment and we were able to wait in the comfort of my dad’s house – rather than in a shopping center parking lot or who knows where else in triple-digit temperatures. And the battery was replaced for free-three months before the three-year warranty was up. The following day, I had an appointment for an oil change scheduled and at that time we likely would have discovered the battery problem during the appointment, but I probably wouldn’t have thought to look in the glove department for the AAA receipt. So here I am today, with the air conditioning cooling our house and feeling extremely grateful that we had a cool place to go while we were waiting for it to be repaired. And though our house is currently in a state of disorder, I am – at least at this very moment – feeling very zen and at peace with the ebb and flow of life.